The Porsche customer teams of the Pirelli World Challenge (PWC) are set to return to Portland International Raceway in Oregon for the first time in 13 years. The long storied “Rose Cup Races”, now in their 58th year as a Portland motorsport tradition, will host North America’s premier sprint-format GT car series July 13 – 15 for Rounds 7 and 8 of the SprintX Championship. Six Porsche customer teams, including two in the top GTX class and four in the GTSX category, are entered in the twin 60-minute races on the 12-turn, 1.967-mile road course. Scott Hargrove (Canada) comes to Portland two-points behind in the overall Drivers’ Championship with six races remaining – four SprintX and two Sprint (50-minute, single-driver) across three weekends. The two-time PWC GT class winner will share the No. 96 Pfaff Motorsports Porsche 911 GT3 R with Wolf Henzler (Germany) as he attempts to reclaim the overall title lead. The Porsche Young Driver Academy graduate tops the Sprint Championship with only two races remaining in the single driver format championship – held August 31 – September 2 at Watkins Glen International. Challenging the Pfaff machine in the Pro/Pro class will be the No. 24 Alegra Motorsports Porsche 911 GT3 campaigned by Porsche factory driver Michael Christensen (Denmark) and Atlanta, Georgia’s Spencer Pumpelly. The 24 Hours of Le Mans-winner is currently in third-place overall in the Drivers’ Championship. 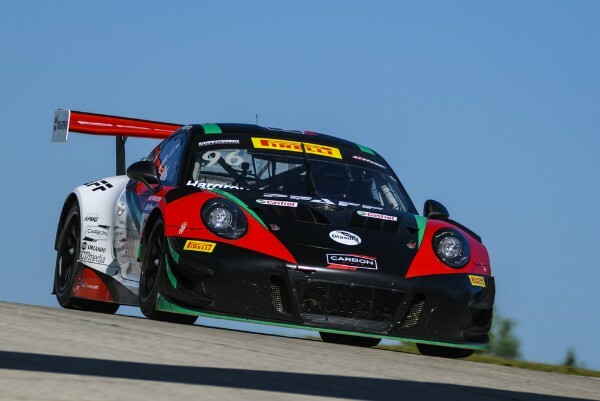 Christensen and Alegra took their rear-engine 911 GT3 R to the most recent PWC class win at Road America – one week after his first Le Mans title. Christensen and Pumpelly also took to the top-step in Lime Rock Park in May. Porsche is second, one mark behind Ferrari in the Overall Manufacturers’ Point Standings having won four races (two each for Pfaff and Alegra). Four Porsche Cayman GT4 Clubsport MRs are entered in the GTSX class for GT4-specification, road-car derived race cars. The No. 13 flat-six, mid-engine machine is entered for Canadians Orey Fidani (Canada) and Kyle Marcelli by Canada’s top Porsche dealer, Pfaff. The pairing is the only Porsche entered in the Pro/Am category of the GTSX class. Racing in the all Amateur division of GTSX are a pair of Muehlner Motorsports America-prepared entries and the No. 66 TRG Cayman GT4 Clubsport MR. Unlike the GTX class which requires by rule a drivers’ change, the GTSX class allows a single driver to race the full 60-minute event. While the cars must still make a pit stop to keep balance across the class, there is no mandate to have two drivers. As a result, longtime Porsche entrant Muehlner has declared solo attempts for Moritz Kranz (Germany) in the No. 21 and the No. 32 with Keith Jensen (Puerto Rico) behind the wheel. TRG will have Derek DeBoer of nearby Ashland, Oregon and Sean Gibbons (Argyle, Texas) in its familiar blue and yellow. Practice for the feature Rose Cup Races will begin on Friday, July 13 with qualifying set for Saturday morning. Race 1 will run at 1:10 p.m. PT/4:10 p.m. ET on Saturday afternoon. The fastest race lap in Saturday’s event determines the grid for Sunday’s 60-minute race. The July 15 race will take the green flag at 11:55 a.m. PT/2:55 p.m. ET.